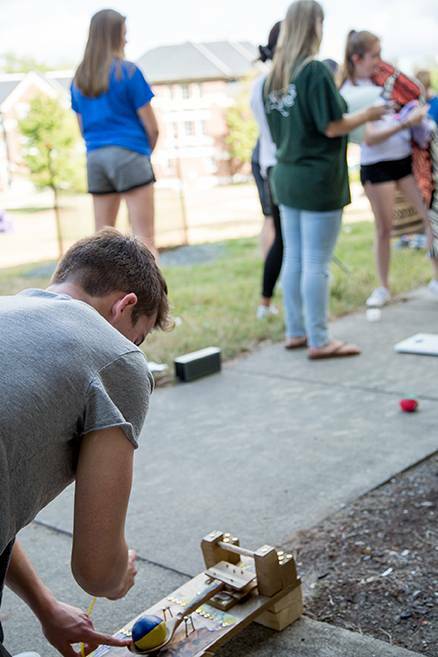 Students in Becky Simmons’ Engineering Innovation class assembled devices made of springs, wooden spoons, bits of string, tubes and other various materials on a sunny day on the East Campus quad. The challenge, called “fall fling,” had one objective: to launch a juggling ball from one device and catch it in a spray paint cap inside another device. The stakes were high – the students’ grades depended on the number of catches in a specified time period, as well as the distance the ball traveled – but the students still had some fun with the assignment, making their devices match a theme. One looked like a Hubble telescope, while another was a mini replica of the court in Cameron Indoor Stadium. Anuj Thakkar, a sophomore who is pursuing the I&E Certificate, was one of the team members adjusting the mini basketball court. As a mechanical engineering major at the Pratt School of Engineering, he was required to take Engineering Innovation, or EGR121L. The class can also count toward the I&E Certificate’s Technology & Design Pathway. Thakkar said he chose to pursue the I&E Certificate because he’s been interested in startups for some time and wanted to be surrounded by likeminded people. The two-week project required students to learn how to design within constraints. A previous challenge focused on reverse engineering, and groups were tasked with taking apart household appliances and determining how to make them more cost effective. Throughout the semester, the students also go through the following challenges: designing a Happy Meal toy using SOLIDWORKS and 3D printing; identifying, defining, and solving a true problem on campus; and designing a Rube Goldberg machine that will allow a ball to travel in a complex series of paths from group to group, initiating an electronic sensor at each group’s stop. “It’s a great early opportunity for the students to do design innovation prototyping,” Simmons said.